2 In large bowl, combine ricotta cheese, egg, Knorr® Vegetable recipe mix, 1 cup mozzarella cheese, Parmesan cheese and pine nuts; set aside. 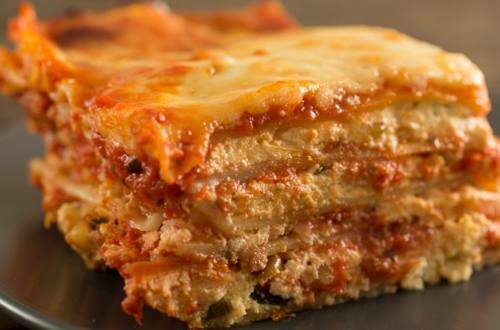 3 In 13 x 9-inch baking dish, layer 3/4 cup pasta sauce, 3 noodles and 1 cup ricotta mixture. Repeat layers, ending with 1 cup Sauce. 4 Cover with aluminum foil and bake 40 minutes. Remove foil and sprinkle with remaining 1 cup mozzarella cheese. Bake an additional 10 minutes or until cheese is melted. Let stand 10 minutes before serving.